I am a procrastinator by nature - especially when I know there is a deadline. I did manage to get a bunch of photos together finally for my application to teach a workshop. I plan to use this one for that application and for another art festival. 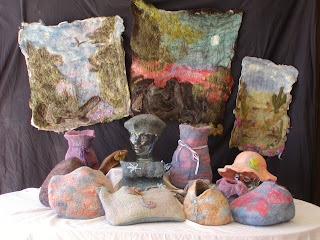 I like the mysteries of felting and enjoying seeing people's reactions to their own efforts. It is not hard to do. I teach it here at the ranch the last Saturday of every month (except for next month, July when I will be teaching it in New Mexico). For 2 1/2 hours of time and about $20 people can make a work of art that is totally unique. I like to make the wearable art, because then you can show it off.